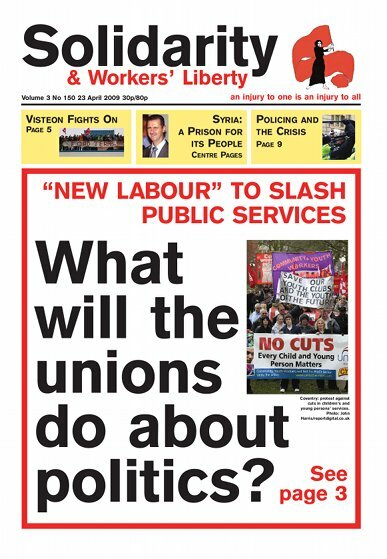 After the Budget cuts: what will the unions do about politics? Politics as farce: how do we change that? "No2EU": No to free movement of labour? Roma in Italy: "We are not maggots"
We know what the Tories are going to do about politics in the wake of Alistair Darling’s Budget of 22 April, announcing huge cuts to come in public services. They will build on those cuts. The Tories are already promising to beat down public-sector pay and to rip up the agreements on public-sector pensions. We know what the Liberal-Democrats will do. For some years now they have favoured laws to enable the Government to ban all industrial action in “essential services”. Continuing a series on misunderstandings, misrepresentations and lies about the Alliance for Workers’ Liberty. The public holiday on 1 May will see big demonstrations across France. Behind the mobilisation lies a picture of rising unemployment and growth of industrial militancy. On April 18, those involved in the wave of university occupations over Gaza, and other left-wing student activists, met at a “coordination” conference to discuss the way forward for the student left. About 90 took part, including members of Workers’ Liberty, Education Not for Sale, Workers Power and Weekly Worker (CPGB), with the SWP sending along a contingent to keep an eye on things. The clear majority was unaffiliated, with a large number of anarchists. Il Divo means “star" or “celebrity” in Italian. There is nothing, ostensibly, charismatic about former Italian Prime Minister Giulio Andreotti, at least as he is played in the film of the same name. Yet other politicians flocked around him, women fawned over him, the establishment danced around him. Such is power. In the end he probably got away with massive fraud and corruption, facilitated by links to the Mafia… and perhaps worse. Review of "In the Loop". The plot of In The Loop rushes along like an unstoppable current, with the frantic bumbling and dodgy-dealing characters bobbing on it towards a seemingly inevitable decision to go to war in the Middle East. In Scotland No2EU is backed not only by the Communist Party of Britain (CPB, the “Morning Star” faction of British Stalinism) but also by “Solidarity Scotland” (launched after its core membership split from the Scottish Socialist Party in 2006). Despite a scattering of branches round Scotland, “Solidarity Scotland” is more a flag of convenience than a cohesive political movement. The two socialist organisations which still support it, on paper at least, are the Socialist Party (SP) and the Socialist Workers Party (SWP). The expanded platform published on the website of the No2EU campaign for the 4 June Euro-elections denounces “the so-called ‘free movement’ of labour” in the EU and “the social dumping of exploited foreign workers in Britain”.